PizzaExpress is something of a pizza institution, famous for mouthwatering pizza, beautifully designed restaurants and friendly service – a destination for all occasions. Enjoy the theatre of watching your food being freshly prepared by expert Pizzaiolos in our signature 'open kitchens'. Pizza in Style. 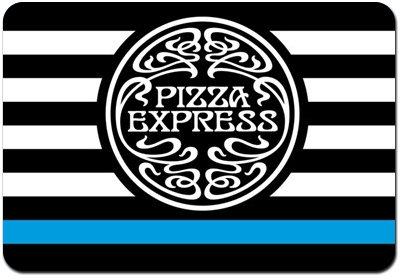 eGift Vouchers may be redeemed for goods in any PizzaExpress in the UK and Northern Ireland, where such store accepts payment in GBP sterling. eGift Vouchers will only be redeemed where customers produce a valid voucher either displayed on a mobile phone or clearly printed from an email at the point of sale. PizzaExpress reserve the right to reject illegible or incomplete eGift Vouchers. A Voucher can be used as full or part payment for PizzaExpress goods. No change will be given on eGift Vouchers. If a Voucher is utilised for part payment, a separate Voucher will be issued to you to the value of any remaining balance which can be spent on future purchases. The remaining balance of a Voucher and expiry date of a Voucher can be checked at any time by calling PizzaExpress Customer Services on 0845 130 2715. eGift Vouchers cannot be redeemed for cash or paper gift vouchers and are not for resale. eGift Vouchers will expire on the date shown above, and any remaining balance will be forfeit following expiry of any Voucher. PizzaExpress is not responsible for any lost, stolen, undeliverable or delayed eGift Vouchers or any network failures. If a Voucher is deleted, or you change your mobile phone number or email address after purchasing a Voucher, or if you should have any other queries concerning eGift Vouchers please call or email our customer services team on 0845 130 2715 or enquiries@pizzaexpressgifts.com.